The reason for all this media interest is that it is Rabbit Awareness Week, an annual effort to raise awareness of these lovely creatures and what it is they need to be happy and healthy. The sad fact is that many people still think it is okay to keep a bunny on his own in a hutch at the bottom of the garden. No, no, no! Bunnies are intelligent, active, curious, social creatures. They need to be able to run and jump, they desperately need company and things to do. 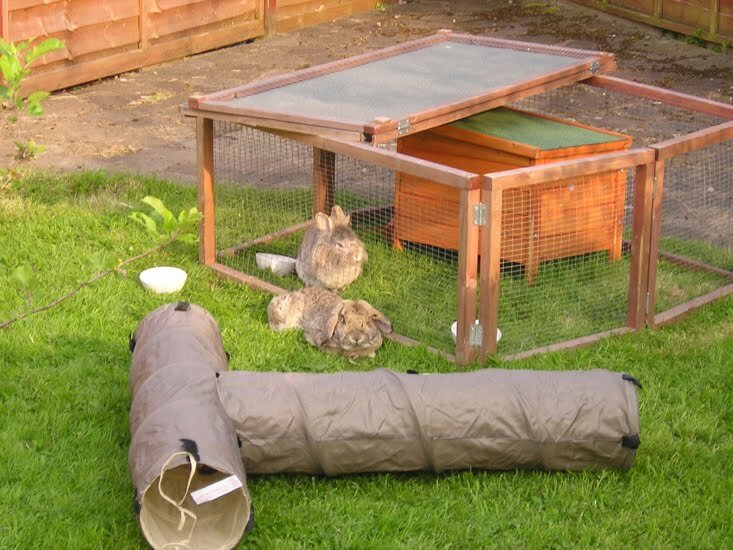 It is so, so cruel and unfair to keep a rabbit alone, in a small hutch. I feel physically sick when I see the size of some of the small hutches sold in pet shops - a rabbit couldn't even stand up on his hind legs. Have a look at this video. I watched it for the first time last night and it really stopped me in my tracks - just imagine what life is like for a bunny alone in a hutch, and then think what it could be like if that same bunny had a companion and some space to run around. 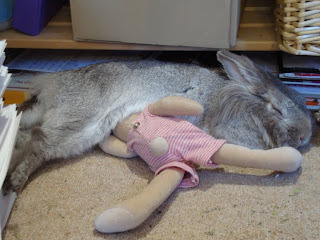 Those of you who read this blog regularly will know all about Humphrey, my lovely house rabbit who 'helps' me run Cottontails. He really does have a happy life. He is a house rabbit, but with regular access to the garden. He is never caged (it is perfectly possible to litter train bunnies) and although he doesn't have a rabbit companion he is closely bonded with me. He is in the office with me every day, in the sitting room every night. He lives a charmed life! Cottontails: Humphrey, please tell us about your accommodation. Humphrey: My main place of residence is the top floor landing where I have a big blanket, a litter tray and a willow cottage to sleep in. I am free to run around the house but I don't like to go down stairs any more, I used to when I was a young buck but these days I prefer to chill out in my own space. Cottontails: And what about your work place? 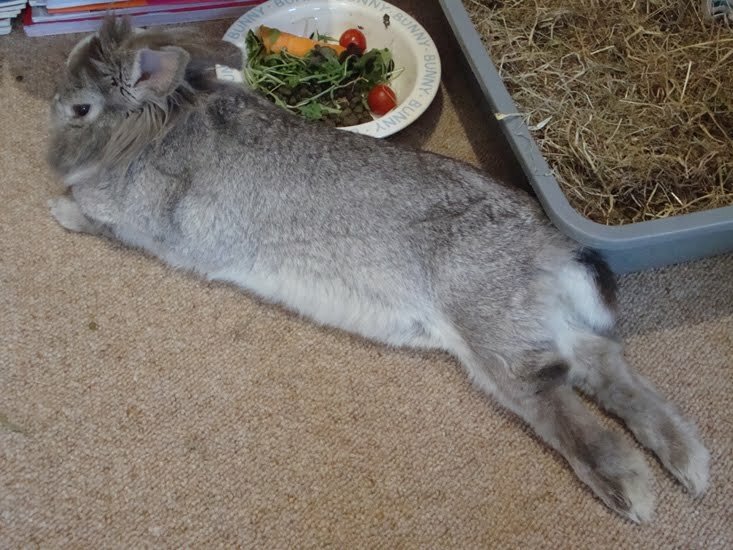 Humphrey: I work out in the Cottontails office every day where I have another litter tray. I am free to wander around the office but mostly sleep under the desk. Cottontails: Do you ever go outside? Humphrey: Oh yes, I love the great outdoors. I have two runs in the garden - one just outside the office and one over by the vegetable patch. And sometimes I run around the whole garden but that is a rare treat saved for weekends when mummy can chase after me. Cottontails: What do you like to eat? Humphrey: I eat a dried pelleted food, lots of dark green leafy salad, carrots, herbs and celery. I also eat a lot of hay - for us bunnies hay is a bit like you humans eating your five a day. It's very good for me. Mummy has recently ordered some lovely Timothy Hay from The Willow Warren. I love it, it's far nicer then the dusty stuff in petshops. I used to have the odd but of toast, biscuit and at Christmas I was allowed some bits of mince pie, but then I got poorly so now I am only allowed rabbit treats. At the moment I am really enjoying a small branch of apple tree every day. Cottontails: Humphrey, you are a bachelor. Have you ever been married? bonded with mummy and we spend a lot of time together. Cottontails: How is your health? Humphrey: Pretty good. My digestion is good because I eat up my hay, and I am lucky to have good teeth. I have vaccinations twice a year against myxi and VHD so there's no danger of me getting those nasty infections. I have an excellent rabbit vet - Andy Barwise at de Montfort Veterinary Hospital in Evesham. We live in Herefordshire now so quite a way away but we still travel back to see Andy because he is a rabbit expert. 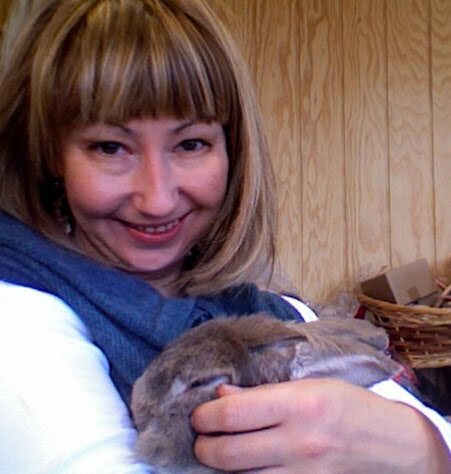 A couple of years ago one of their vet nurses, Nicky, organised a Rabbit Awareness Day and I went along as a star guest! Cottontails: Do you go on holiday? Humphrey: Yes. I usually go to stay with my Aunty Diane at Hoppy Holidays. It's lovely there, Diane looks after me very well with plenty of spa treatments and massage (cuddles and strokes) and it's all inclusive with delicious food. Humphrey: Around dawn I wake up and bang my food bowl about a bit, sometimes I race around the bedrooms on the top floor. After a long and boring wait mummy will eventually get up and she brings me out to the office, gives me breakfast and we start work for the day. I have the job title of 'Floor Manager' in the office, seeing as I am based, erm, near to the floor. 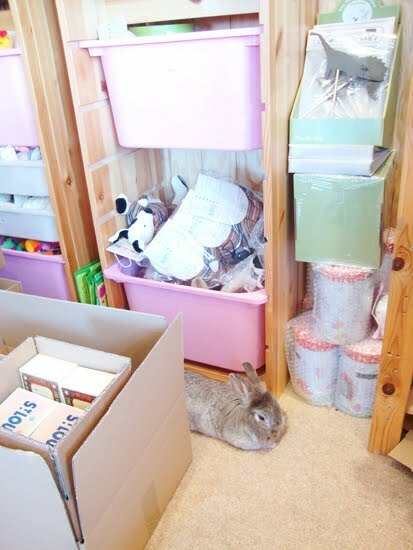 I am in charge of marketing and frequently feature in blogs and on the Cottontails face book page, and I often help with unpacking boxes too. I love to shred cardboard. If the weather is fine I will sometimes go out into my run for a while, I quite like to snooze in the sun and eat daisies. In the evening mummy carries me into the sitting room where I have supper and mooch about a bit, then chill out between an armchair and the radiator. I usually spend a good hour on mummy's lap. (Last night we watched The Apprentice together.) At bedtime I am taken up to my landing spot and given some supper and an apple branch to nibble on during the night. 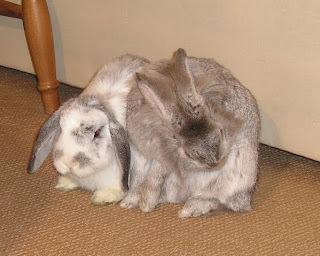 Cottontails: And finally Humphrey, what would you say a bunny needs to be happy? 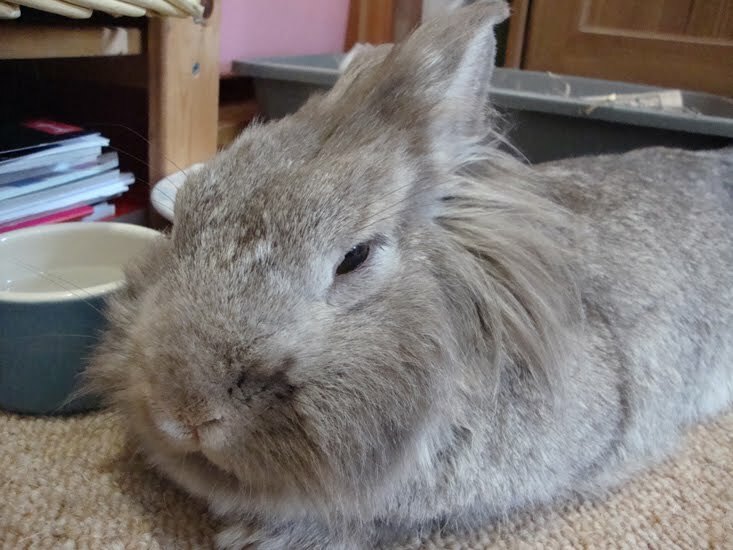 Humphrey: Space to run around with safe places to hide, companionship with either another bunny or a human, a nice diet with lots of hay, plenty of things to do - boxes to shred, branches to nibble, regular health check-ups and vaccinations. 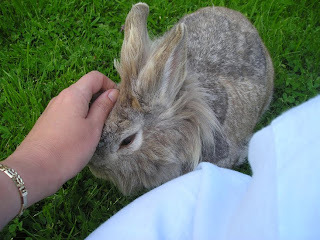 Lots of affection but also lots of respect - we bunnies are quite proud little creatures, and even though I love cuddles a lot of bunnies would prefer to be stroked on the ground and don't much like being picked up a lot. And finally organic carrots with tops on. Preferably from Waitrose. Humphrey: You are welcome. And that will be my standard £500 interview fee please. Ahhh, Humphrey is so beautiful, and your interview really made me smile! He is certainly treated like a prince - thank goodness for responsible owners like you. First we love your whiskers. Second, as always, you've put it in a nutshell with AFFECTION and RESPECT. WE can see why you charge top dollar, er, pound for your interviews. What a lovely insightful interview, i can see why Humphrey is in charge of marketing! Oh, I love Humphrey even more now. I had no idea he was so articulate! Please give him a smooch on his silky ears. 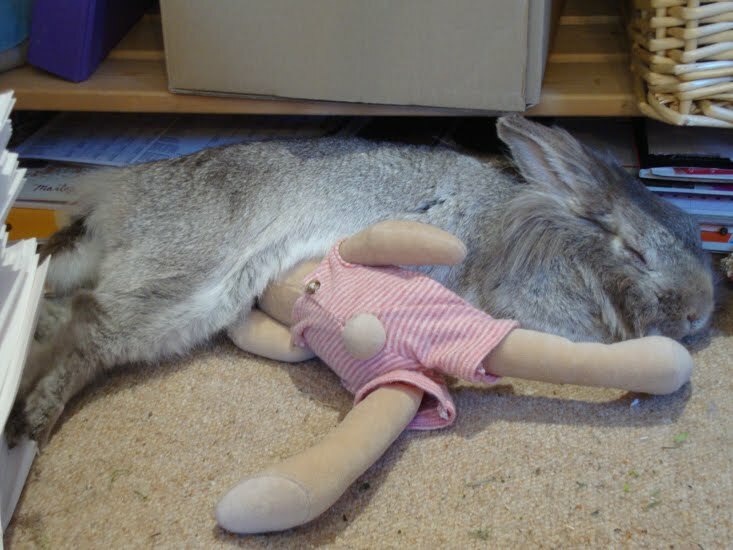 Oooh I would LOVE a rabbit, especially one as obviously special as Humphrey. Alas, my big cat Archie, thinks rabbits are SO tasty and I would be permanently worried (like you I wouldn't want my bunny to be caged). Love the interview, I really think you should have paid the fee, well maybe you could pay by instalments...... with carrots!! excellent version of springwatch! loved it! !